MAGDALENA OF CANOSSA, was a woman who believed in the love of the Lord Jesus and, sent by the Holy Spirit among those most in need, she served them with a Mother's heart and an Apostle's zeal. Born in Verona on 1st March 1774, of a noble and wealthy family, she was the third of six children. By way of painful events such as her father's death, her mother's second marriage, illness, misunderstanding, the Lord guided her towards unforeseen paths on which Magdalene tentatively set out. Drawn by the love of God, at the age of seventeen she planned to consecrate her life to God and twice tried her vocation at a Carmel. However, the Holy Spirit urged her to follow a new path: to allow herself to be loved by Jesus Crucified, to belong to Him alone, in order to dedicate herself exclusively to those in greatest need. She returned to her family and, being compelled by sad events and the tragic political circumstances at the end of the 18th century, she nurtured her true vocation in the depth of her heart and went on with life at Canossa Palace, shouldering the burden of running her family's large estate. With complete dedication Magdalene carried out her daily tasks and widened her circle of friends while at the same time remaining open to the mysterious action of the Holy Spirit who gradually moulded her heart and enabled her to share in the love of the Father for mankind revealed by Jesus' complete and supreme offering of Himself on the Cross, and by the example of Mary, the Sorrowful Virgin Mother. Moved by that love, Magdalene responded to the cry of the poor, hungry for food, instruction, understanding and the Word of God. She discovered them in the suburbs of Verona, where the echoes of the French Revolution, the occupation by various foreign powers and the Verona uprising had left evident signs of devastation and human suffering. Magdalene sought and found her first companions called to follow Christ, poor, chaste, obedient and who were to be sent out as witnesses of His unconditional Love towards all people. 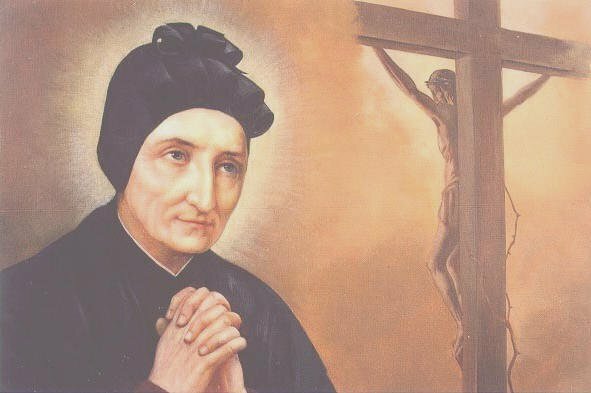 In 1808, Magdalene overcame her family's opposition and left Canossa Palace once and for all to begin in the poorest district of Verona what she knew in her heart to be the Will of God: to serve the neediest persons with the heart of Christ. Charity is like a blazing fire! Magdalene opened her heart to the Holy Spirit who guided her to the poor in other cities: Venice, Milan, Bergamo, Trent ... In only a few decades the number of her houses increased, her religious family grew in the service of the Kingdom of God. Charity schools, providing an all-round formation geared to pupils status in life. Catechesis, given to all classes of people, with special attention to those most ignorant of the Faith. Support given to women patients in hospital. Residential seminars, to train young teachers for rural areas and valuable helpers for parish priests in their pastoral activities. Yearly courses of Spiritual Exercises for Ladies of the nobility, with the aim of deepening their spiritual life and involving them in various charitable works. Later on, this last activity was offered to all those who had a desire for it. Contemporary to Magdalene and her apostolic work, flourished other witnesses of Charity: Leopoldina Naudet, Antonio Rosmini, Antonio Provolo, Carlo Steeb, Gaspare Bertoni, Teodora Campostrini, T. Eustochio Verzeri, Elisabetta Renzi, Cavanis brothers, Pietro Leonardi, all of whom founded Religious Institutes. The Institute of the Daughters of Charity, between 1819 and 1820, received its ecclesiastical approval in the various dioceses where the communities were present. His Holiness Pope Leo XII approved the Rule of the Institute with the Brief Si Nobis, of 23rd December 1828. Towards the end of her life, after unsuccessful attempts with A. Rosmini and A. Provolo, Magdalene was able to start the male branch of the Institute which she had planned to set up from the very beginning. On 23th May 1831 in Venice, she began the first Oratory of the Sons of Charity for the Christian formation of boys and men. She entrusted it to the Venetian priest Don Francesco Luzzo, helped by two laymen from Bergamo: Giuseppe Carsana and Benedetto Belloni. Magdalene's active and fruitful life ended when she was 61 years of age. She died in Verona surrounded by her Daughters on 10th April 1835. It was the Friday of Passion Week. Above all make Jesus Christ known! This heartfelt concern of Magdalene's was the great inheritance that the Daughters and Sons of Charity are called to live, a life of complete availability to God and service towards others, willing to go to the most distant countries for the sake of this holy work. (MAGDALENE, Ep. II/I, p. 266). The Daughters of Charity traveled for the Far East in 1860. Today there are about 4000 sisters throughout the world, grouped into 24 provinces. The Sons of Charity number about 200. They work in various cities in Italy, Latin America and the Philippines. Canossian Religious, called to a missionary vocation, "ad gentes", make themselves receptive to those basic Christian values, "the seeds of the Word", present in every culture while giving witness to and proclaiming what the "have seen, heard, contemplated...": the Love of the Father who, in Christ, reaches out to every person so that they may have life. Through this giving and receiving, the charism is enriched and bears fruit for God's Kingdom. The charism which the Holy Spirit brought to life in Magdalene did not exhaust itself in the vitality of the two Institutes. Consequently, various groups of lay people have found in Magdalene and in her ideals, their special way of living the faith, of witnessing charity, in all walks of Christian life. The Church draws our attention, especially that of her Sons and Daughters, to Magdalene, a Witness of the constant and freely given love of God. We give thanks to Him for the gift of this Mother and Sister of ours and through her intercession we ask that we may love Him, as she did, above all other things, and make Him known to our fellow men by living our specific vocation.